Acidophilus is a cultured, low-fat milk that can aid digestion. If you have a hard time digesting dairy, we’d like to introduce you to our Low Fat 1% Acidophilus Milk. It looks like milk. It tastes like milk. It has the same nutrition profile as milk. So, what makes it different from conventional milk? A common probiotic, called Lactobacillus acidophilus, is added to the milk to aid digestion and help the immune system. 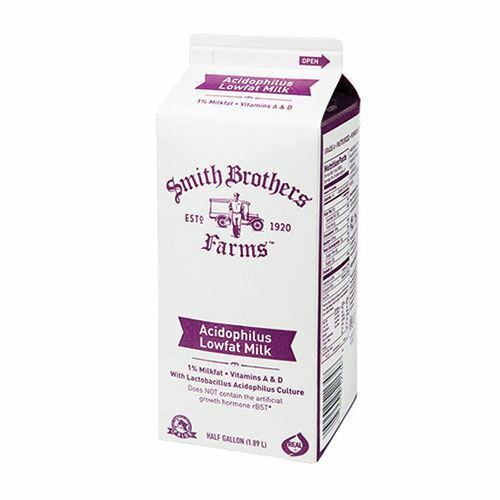 Like all Smith Brothers Farms milk, it’s rBST-free and gently pasteurized for that farm-fresh flavor. My husband is lactose intolerant, regular milk gives him bad side affects, this does not. But the taste is still very good compared to store bought. He loves his cereal, pudding ect, but was never able to eat it due to the lactose issue and store bought was disgusting, this tastes great and does not leave him with horrible side affects afterwords. Have been drinking Acidophilus for years - it's easier on my stomach. It was so hard to reliably find in grocery stores in the 1% variety, and often not at all! Smith Brothers is so great at having it for us every week - thank you! We have been drinking this for years, and it is our family’s favorite. It works so much better than other lactose-free options for us. Highly recommend the switch for any milk drinker—lactose issues or not!